Rigid control is fomenting a backlash from the underground community. These are organized in many ways and are not "enemies" of the government a priori, indeed they collaborate in social development. The help of the communities to stabilize marriages is viewed in a positive way by the state. 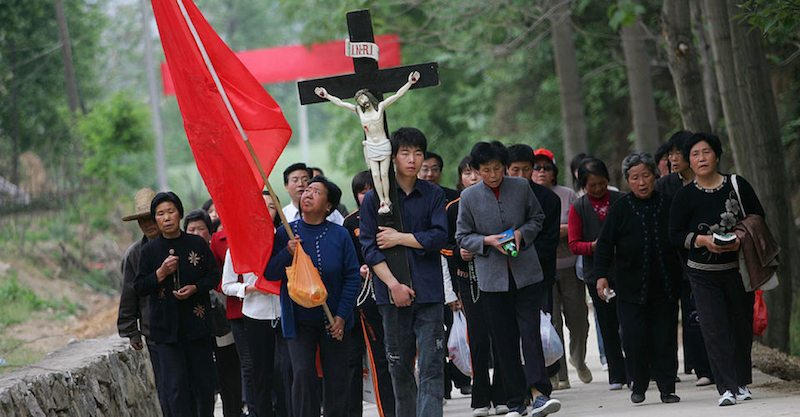 The new regulations on religious activities launched by Xi Jinping are perhaps doomed to failure. But there are also many Christians who for various reasons work outside of this scheme and are missing in anything with this. For Protestants there are those who are "house churches call": they often meet in private homes because they are not allowed to have their churches to practice their faith even if in fact they do the same, but at home. For Catholics have "underground churches": they also meet in private homes and are officially considered illegal, and the government tries to suppress them. The people taking part is not necessarily contrary to the government, but they want to practice their faith according to a theology that is not the one promoted by the government with the Patriotic Association. The government wants to unify the Chinese official and underground church but it is a challenge rather difficult. On the other hand, Christians sometimes fit in very creative ways in Chinese society. For example, in Shanghai there is a Christian pastor who runs a company, a community that is registered as a company, not as a Christian group, either as NGOs: is a "consulting company" that provides help, maybe even business advice, but especially with regard to marriage and family. In fact it is a Christian group: all employees are Christians led by the pastor; They have a room for activities; have space for worship and organize activities on weekends, as a parish. But being registered as a company, the government does not touch her, or rather see well because it recognizes [that in Chinese society there is] a problem in divorce, in family problems, in the divisions. This group provides moral support and not being protesters, are accepted locally as a good thing, even if everyone knows what it is. Another Christian group composed of foreigners - approved by the government - is also organized as a company and is focused on the family. Here in the US is well known, focused against abortion, they provide family counseling on family values. You can tell that they have positions to conservative Christians, even in China. And the government like because from his point of view in some way help to the stability of families and society. There are also Buddhist groups organized as companies that support cultural centers in their temples. There are in fact many groups. One way that people live these activities is inventing stories, lying if you will, that is, people know that there are these groups, which are asked, but registered as companies, but having positive purposes people leave to run ... Every culture does this, in China I think is just more "extreme" because the government is authoritarian. I believe that to some extent, the Chinese leader Xi Jinping would like to get rid of this thing, would put everything clearly and in the same plane. He knows what's going on and would like to clean up this attitude. He thinks it is necessary to rationalize and that the new regulations are able to achieve this goal. If this is possible, it is a big question ... [but I] do not think this will be possible. If you pull too much on this point, it is likely to be counter-productive.